The term cleavage in the gemstone world refers to the propensity of a mineral to split along defined planes. The cleavage characteristics of a mineral are one of its identifying properties, and a factor that must be taken into account when cutting or setting a gemstone. The cleavage planes are a function of a mineral's crystalline structure. In certain minerals the molecular cohesion between layers of atoms is weaker in certain directions, and breakage will occur along smooth, flat surfaces that are parallel to the zones of weakness. Geologists use the the analogy of splitting a piece of wood to illustrate this: the wood can be easily split along the grain, but resists splitting across the grain. The difference between a cleavage and a fracture is that a fracture is arbitrary and non-repeatable -- it can occur anywhere on the body of a mineral, in any spatial direction, with little chance of an identical fracture occurring. A cleavage, on the hand, is predictable and repeatable. A mineral can have one or more cleavage planes. A mineral can cleave multiple times along its defined cleavage plane, and with each separation in parallel. There are 6 different categories of cleavage, which describe the way the mineral separates under stress. For example, basal cleavage occurs on a horizontal plane in one direction only, while cubic cleavage occurs in three directions, making smaller cubes from larger cubes. Cleavage is of special concern to gem cutters and jewelers. 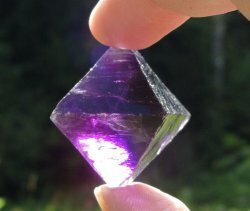 In gemstones with perfect or excellent cleavage, the facets must be cut at right angles to the cleavage planes so the gem will be less vulnerable to breakage. Jewelers need to take special care since the heat produced when soldering a setting can cause cracks along cleavage planes. The risk is mainly during the cutting and setting process, however; once a gem is set the risk of cleavage is very low. Many gems commonly worn, such as diamond, topaz and tanzanite, have perfect cleavage. A number of other gems, such as ruby, sapphire, jade, opal and all the quartz varieties, have no cleavage at all. The following chart summarizes the cleavage ratings for a number of well known gem varieties.